I t’s amazing that something as small and seemingly insignificant as an acorn can produce something as large and majestic as an oak tree. Jesus said that the Kingdom of God is like a mustard seed planted in a field. Although it is the smallest of all seeds it grows into a large tree where birds can nest in its branches (Matthew 13.31-32). We prefer things to be large, exciting and powerful to begin with but God offers us a kingdom that is born out of meekness and humility. When serving God, we like to know we have all the resources before we start but God often wants to plant small seeds and for us to take risks as we step out in following him. Watching something grow and seeing life develop is incredibly exciting! In the fairy tale ‘Jack and the Beanstalk’, Jack’s mother is furious that he sells their cow for some magic beans. She can’t understand why Jack has sold something of value for seeds that appear worthless. Seeds have such potential and power but the trouble is that many of us want quick fixes and instant success rather than waiting for things to grow. 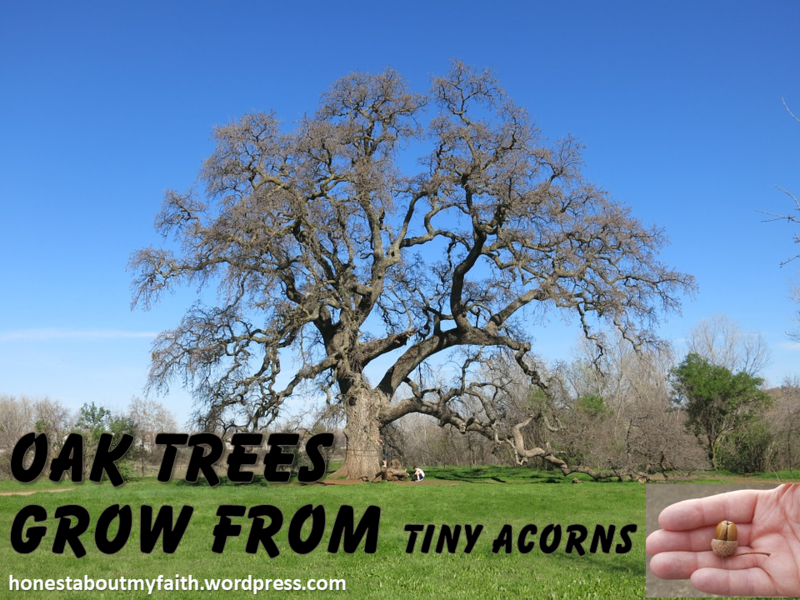 Next time you see or hold an acorn, remind yourself of its potential for growth and that if it is planted and nurtured then it is a picture of what the Kingdom of God is like! At times it can seem like God’s influence in this world is limited, but don’t be fooled. God’s influence and power are at work and they are GROWING more and more each day. If you want to think some more about this parable then you can read Growth Is Happening Even When We Can’t See It. Have you got any thoughts about the kingdom being like a tiny mustard seed planted in a field? If so I would love it if you could share them below in the comments section. This entry was posted in change, Faith, God is powerful, Kingdom of God, perseverance, Power of God, trust and tagged change takes time, God wants us to grow, growing in faith, kingdom of God, kingdom of God is growing, kingdom of heaven, Matthew 13.31-32, parable of the growing seed, perseverance, trust, trust God, trust in God, trust in the lord, trusting in God, trusting Jesus. Bookmark the permalink.